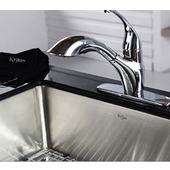 Kitchen faucets come in many shapes and sizes. 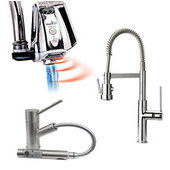 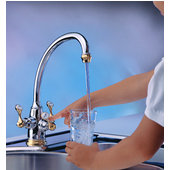 We have a large selection of single-hole, widespread, pull-out spray, wall-mount, hands-free and entertainment/prep faucets from top manufacturers like Whitehaus, iTouchless and Cool-Line. 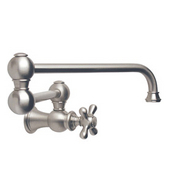 Choose from traditional or contemporary styles with a variety of finishes, from polished chrome to antique copper. 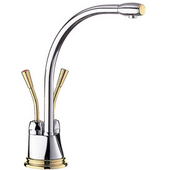 Whatever your decor, you are sure to find the perfect faucet for your kitchen. 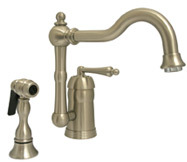 The Whitehaus Collection offers a wide variety of faucet styles and finishes designed with superior craftsmanship in mind at great prices. 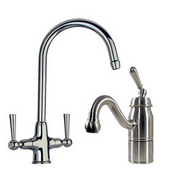 The collection ranges across all faucet types from pot fillers to elegant bridge faucets ranging from traditonal to modern looks to fit all tastes and needs.